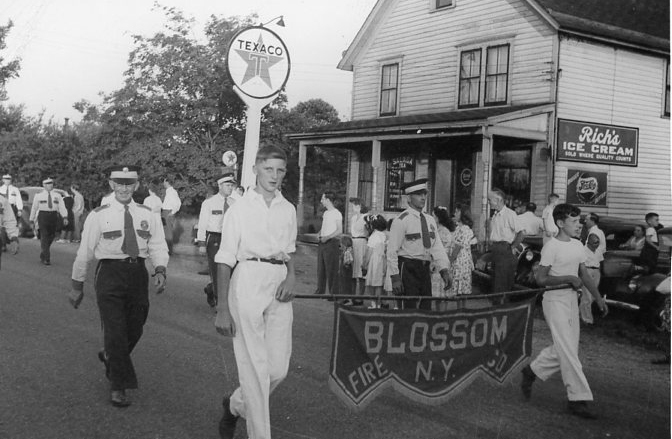 Town of Elma picnic parade down Clinton St. showing George Kling Jr. and James Bull with the banner. Ca. July 17, 1948. 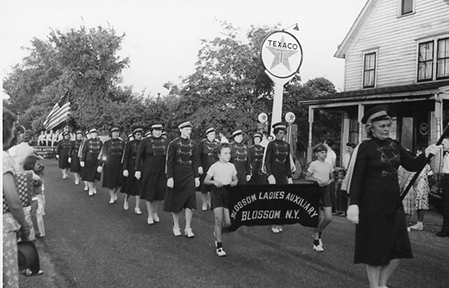 Blossom Fire Company's Ladies Auxiliary marching in the July 17, 1948 parade. Ca. 1800. 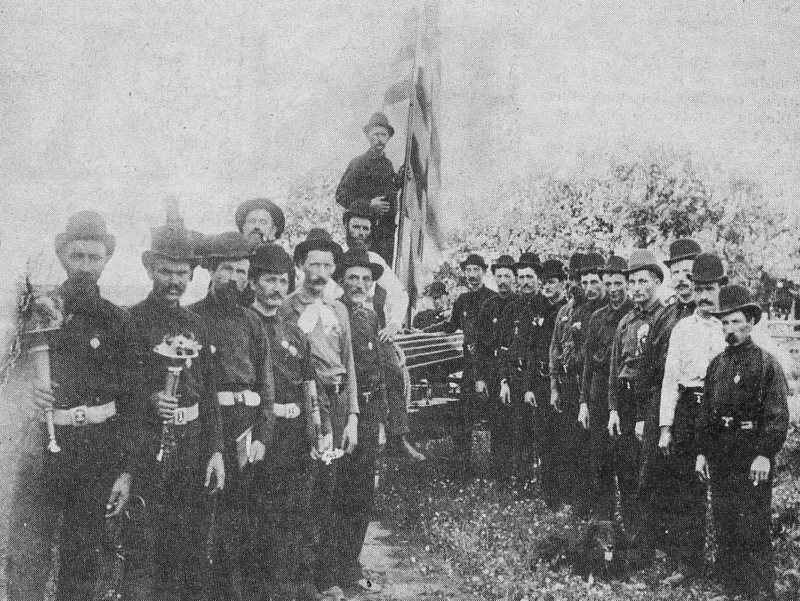 The boy in front of the man holding the American flag is the grandfather of Fred Streif. 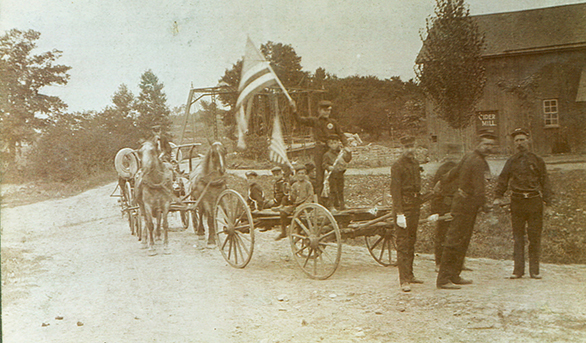 The fireman leaning forward and pulling the wagon is August Landahl, Fred Streif's Great Grandfather. also pictured are John Walter and Mr. Greis. In 1972 the fire company celebrates it's 100 centennial of 100 years with a banquet and installation. In the year of 1872, the following men organized the company: Jocob Koch, William Klieinfelder, Christian Lorey, John Walter Jr., John Koch, Alois Dusch, Heiman Shuster, Charles Schun, Bernard Walter, Jacob Knab, Joseph Knab, William Koch, Michael Becker, Frank Eckert, Louis Mayer, George Hensel, Albert Mayer, Fred Darsteen, Adam Anzone George Dorstein, Charles Stith, Henry Kleinflder. 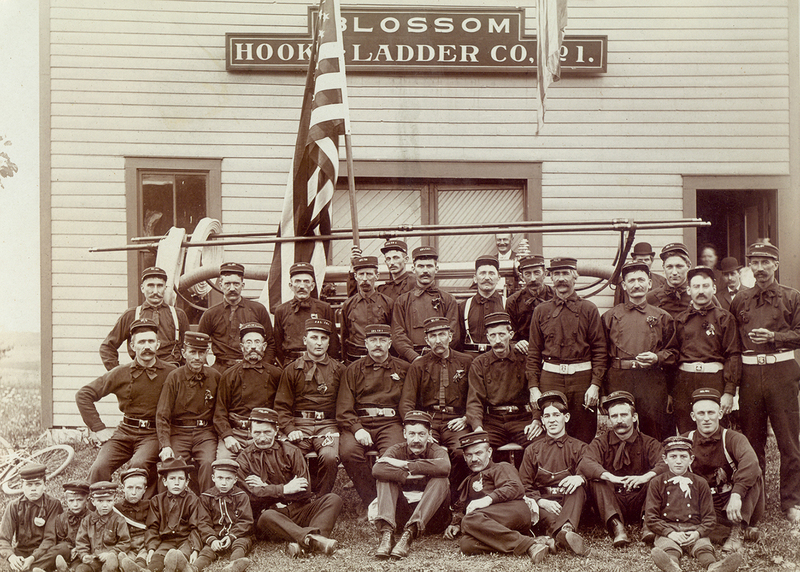 In 1873, a hook and ladder and bucket brigade hand-drawn apparatus was purchased and was housed in the Lutheran church shed. At that time fire alarms were sounded by ringing the Lutheran church bell. 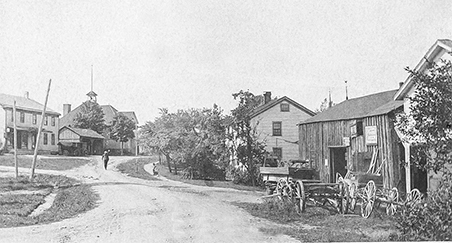 In 1893 a building was built to house the fire fighting equipment and to provide for the fire company's meetings. © 2018, Blossom Fire Company All Rights Reserved.